Here are the Canola Council of Canada’s Top 10 agronomy goals for 2016. Manitoba AgDays is January 19-21 at the Keystone Centre in Brandon. Agronomy Update is January 19-20 at the Sheraton Hotel in Red Deer. FarmTech Conference is January 26-28 at the Edmonton EXPO Centre at Northlands. CropConnect Conference is February 10-11 at the Victoria Inn in Winnipeg. The Canola Watch 2015 exam continues through January for CCAs and CCSCs. The exam is 72 questions based on content from 2015 Canola Watch articles. A pass is worth 6.5 credits. 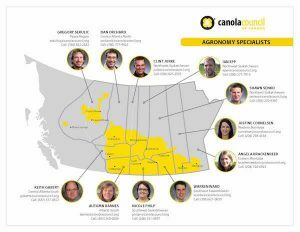 The Canola Council of Canada’s Crop Production & Innovation team is here to help answer your canola agronomy questions. Here are the 11 agronomy specialists with their territories, areas of specialty and contact information. Based on conversations with growers and processing plants, heated canola seems to be higher than usual so far this winter. Please check bins to make sure temperatures are stable.